The world may have handed me a story, but I was the one in control of the ending. Maybe I was stubborn and wanted to prove them wrong. Or maybe, just maybe I had a bigger vision of what was possible. When we’re faced with life’s uncharted territories and have no clue what our next move will be, who do we turn to for guidance? I searched the shelves of a Barnes and Noble Bookstore looking for answers. I needed someone to tell me what to do and how to keep going. There was nothing. I broke down in the middle of store when an employee asked, “Can I help you find something?” No one could help me. There was no roadmap for the path I found myself on. She was right. There wasn’t a roadmap for life’s uncharted territories. It was now up to me to create one. In that moment, I drew a line in the sand and decided that I WAS going to make it through this… no matter what. I set out on a mission to take ownership of my story, share it with others and send a ripple of hope out into the world. I was determined to survive, if only to tell someone else it was possible. I couldn’t change what I had done; no one could. The only thing I could do was prevent others from repeating my mistake. I made a decision to share my story with the world, keep my friend’s memory alive and pray that someone would listen. With an open criminal case on the table and the potential of 15 years in prison ahead of me, I did the unthinkable. I bared my soul to over 15,000 people across the country telling my story of the night I drank, drove and killed my best friend. Nearly eleven years later and I’m still sharing my story. No, it’s not always easy. Most days I would rather hide from the world and hold my family close. But through the good, bad and ugly days, sharing my story has impacted my life (and the lives of others) in more ways than I could have ever imagined. Sharing our stories allows us to keep going. In a time when I felt like there was nothing I could do to “make this right” I knew I had to do something. Sharing my story allowed me to feel as though (in a very small way) I was making a difference. If just one person didn’t repeat my mistake, it was worth all of the pain and sleepless nights that reliving my nightmare caused me. THIS gave me a reason to be alive. Sharing our stories allows us to impact others. We can’t always measure the impact of the work we do. We must have faith that it’s making a difference. Knowing that I may have prevented others from repeating my mistake is enough. Knowing that I may have Inspired others to rebuild after tragedy and failure is enough. Knowing that I may have been able to help others craft and share their personal stories is enough. 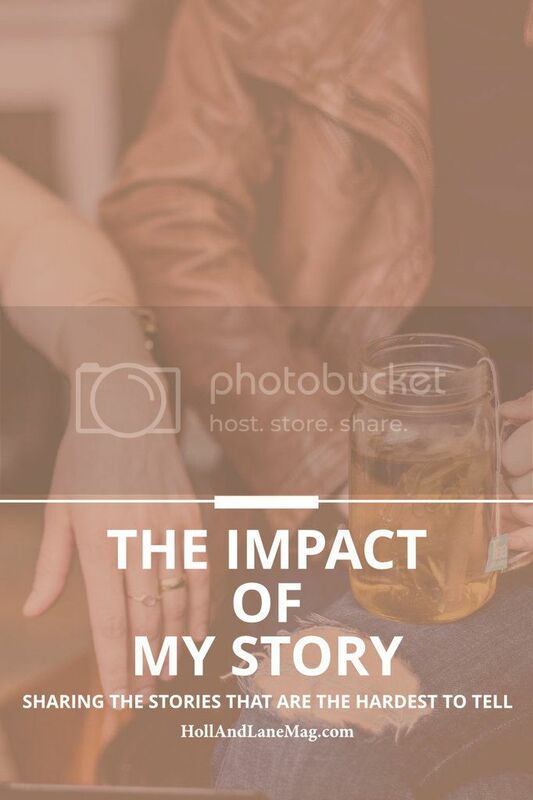 Even when we can’t measure our impact, we have to remember that sharing our story has helped more people than if we kept it to ourselves. Sharing our stories allows us to rewrite them. When you go through these difficult times, society places a story on you. “The drunk driver, the convict, the murderer.” Sharing my story allowed me to TELL my story rather than let someone else assume what it was. I was tired of listening to other people give “their” version of my story. It was time to claim my own voice. Your story matters. No matter how big or small you may think it is, your story has the power to rewrite your life’s message. The question is: Are you going to let others define what your story is or will you be the author of your own story? You can’t rewrite it if you never tell it. Jessica is a Motivational Speaker and Transformational Coach who has shared her story of turning her “mess into a message” for nearly ten years and has been featured on major international media outlets such as ABC's 20/20, Katie Couric, The Guardian, MTV and many more. Today, Jessica works with female entrepreneurs to craft stories and presentations that connect with their audience and help them stand out from the crowd. By rewriting their story, her clients are transforming what were once considered “liabilities” into some of their greatest business assets.